The smell of sweet grass, ruffled by a breeze, permeates the air as the 2 dozen sheep graze, their shepherd watching over them. Teresa is only 15 years old, but she escourts her family’s sheep to the pasture near her house in the Italian countryside often. Sometimes, she’s joined by Donato, 18, who brings the 100 sheep owned by his family to the pasture to graze as well. Teresa’s parents aren’t fond of Donato, but she is. When they’re not around he’ll come over to talk to her. It doesn’t take long for them to fall in love. They were married on a Sunday in 1946. It was a small wedding, with a church ceremony in the morning and a lunch prepared by Donato’s aunts. “And then on Monday he went back to work,” Sonia translated for Donato with a laugh. 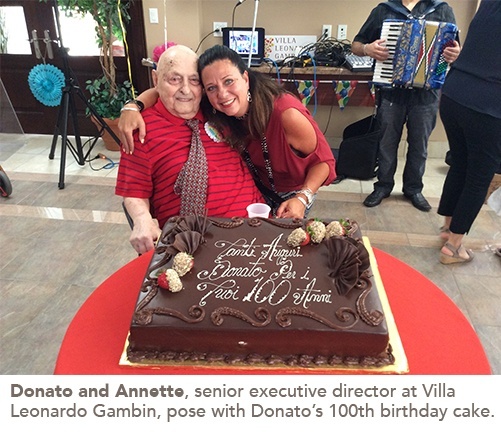 Born in Italy in 1917, Donato recently celebrated his 100th birthday at Villa Leonardo Gambin in Woodbridge, where he lives. Donato’s family all came to the party, along with all the team members at Villa Leonardo Gambin, and many family members of other residents. “He feels great and proud about turning 100,” Sonia translated, adding that Donato doesn’t believe there is a secret to turning 100, but admits that he has limited his coffee and abstained from all alcohol since he turned 80. In his youth, Donato was quite active, with a variety of jobs that required physical endurance. On top of shepherding the family sheep, he picked olives in the winter, harvested wheat by hand with a scythe, and even worked up in the mountains during the summer, making charcoal and planting trees. He was only 14 when he started working. “Making charcoal in the mountains was the worst job he ever had, and it’s the worst job that exists,” Sonia translated for Donato. He’d work 14-15 hours a day, from dusk until dawn, staying in a cabin in the mountains with the other workers. The roof of the cabin was covered with 3 inches of soil so that the water wouldn’t come in when it rained. Every day, he would go up to an igloo they had built the winter before and drag a block of ice, weighing 100kg, the half kilometer back to camp on a piece of wood. As the ice melted, it provided the camp’s daily water supply. He was about 18 at the time. Making the actual charcoal was a 10-day process, according to Donato, and involved stacking wood, setting it on fire, and covering it with grass and soil. His supervisor would come around and smell the pile to see if it was ready, when it was, they’d remove the grass and soil to reveal the charcoal. Every few days, men with donkeys would come to collect the finished charcoal, which they would sell. When he was 21, Donato was forced into WWII by Mussolini’s regime. Those who refused to join were arrested. He worked as a flame thrower, but said he rarely had to use it, because they didn’t encounter many troops. He also worked on the tanks, creating fog with liquid nitrogen to distract opponents. The first place he went to was Libya. He then went to Egypt, where he was quickly captured by American and British forces and sent to India. While he was there, Donato said that the other prisoners started to go a bit insane, since there was nothing to do. Because of this, their captors invented “fake jobs” for them to do. Conditions were so extreme that Donato said many people aged 20-25 died of hunger and disease, and the heaviest person at the camp weighed no more than 110 pounds. Donato spent 3 years there before being transferred to England, where he spent another 3 years working on a farm. When he returned from the war, Donato went back to his previous jobs. In 1955, Donato immigrated to Toronto, Canada, leaving Teresa and their two children in Italy. He began working at Cascone Sewer Construction Co. Initially, he planned to only stay here for a few years, and send money back to his family in Italy. However, after three years on the job, Donato decided to stay in Canada permanently, and Teresa and their children joined him in Canada. At Cascone, Donato worked laying the pipes, a job he enjoyed. At the same time, Teresa was working picking beets on a beet farm near Eglinton and Dufferin. Donato said that at that time, there were no houses in the area, and he was working to put in the sewers for houses that would later be built in the Dufferin and Lawrence area. He worked at Cascone for 10 years, before suffering a serious injury. He was riding a bus in the Dufferin and Eglinton area when something went wrong. While attempting to turn left, the driver lost control of the bus, which spun out of control, completing three or four circles before crashing into a tree. Donato broke his neck as a result of the crash, and was no longer able to work in construction. Instead he took a lighter job doing maintenance in condominiums. Today, at 100 years old, Donato spends his time in exercise class and socializing with other residents. He looks no more than 80, and is constantly on the move. He enjoys a good game of cards with friends, and can often be found making sure that people haven’t left the television on in the activity room, because it wastes power. As a resident ambassador, he has made it his mission to make sure all new residents feel welcome. In recognition of Donato’s exceptional heart, an annual award has been created in his name. The Donato Panacci Spirit Award will be presented annually to the resident who most embodies what it means to be a resident ambassador, and they will receive their name engraved on a plaque. Key criteria for the award include: Respect for everyone who lives or works at the community, being friendly and welcoming to all who enter, being understanding and accepting of others’ differences, being encouraging and helpful to others, and possessing a kind heart and a positive spirit. These attributes, after all, are truly what define Donato. The first thing Olga Dimitrov thought, as she held her Genie award for the first time, was how heavy it was. The golden statue weighs in at 10lbs, a testament to her outstanding work in costume design for film.